Great Day in the Morning to all Honeybees and Fans! The countdown is nine (9) more days before David Archuleta’s Holiday Tour begins. Personally I am on cloud “9” Haha! I will be attending five concerts: Salt Lake City, Utah, both nights, Santa Rosa and Anaheim, California, and Rexburg, Idaho. All VIP Meet & Greets. The suitcases are packed and ready to go. The camera is loaded and my excitement is brimming over. Looking forward to seeing many of you at the concerts! David continues to be a busy “Bee” this week and provided us with a great many interviews, twitters, voice messages and songwriting updates. In Los Angeles this week David mentioned Trader Joe’s, the glorious store—they should change their name now—attended concerts and experienced the infamous LA traffic, which he stated they are spending a lot of time together! HaHa! Yes, David since I live here I know how you feel. But it does provide us time to finish your entire Christmas from the Heart album before our next stop. 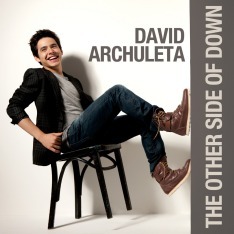 But the most exciting moment this week was the ANNIVERSARY OF DAVID’S ALBUM on November 11, 2009. One year later and we are honoring his hard work and remembering we all knew what a Star he was going to be. We are now on the edge of our seats because of a second album David is working on that will express his personality and feelings. How exciting another anniversary in the future!!! May all of you have a happy and glorious week! Christmas from the Heart features tunes that are near and dear to the teen, who said he loves the holidays because they allow him to get together with family and friends. He recently spoke with CNN about his new album, branching out into songwriting and why he enjoys Christmas in Vegas. CNN: This is only your second studio album, so why Christmas music? 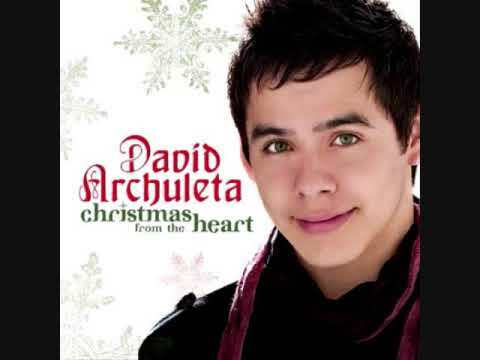 David Archuleta: Christmas music is something I’ve always enjoyed. The holiday season is pretty much a favorite time of the year because of what it’s all about and what it gets people thinking about. That music, for me, is timeless and something people can always enjoy. I always sing during Christmastime, so why not do a Christmas album? It was a really great project for me to do because it is such a special time and season for me. CNN: What does Christmas mean to you? Archuleta: For me, it’s about your memories with your family, that whole holiday season. It’s such a happy and memorable time, so for me, it was all about the memories and remembering. And that’s what I wanted to try and get across with the album. It’s mostly traditional songs, but there is one original song that I helped to write, called “Melodies of Christmas.” It talks about how the melodies help to bring back the fun memories people have. CNN: What sets your Christmas album apart from the multitudes that are already out there? Archuleta: I tried to give the music a reverence. We could have gone more radio friendly because I am in the more pop vein of music, but I wanted to make sure when people listened to it I got them thinking about what the songs were talking about. Whether it was through the vocals or the arrangement, I wanted people to connect with the songs emotionally. CNN: Do you have a favorite Christmas song? Archuleta: I don’t really have a favorite, but I have always loved “O Holy Night.” It’s such a powerful one. There is also one on the album called “Pat-a-Pan” that I really like that’s a more fun one that people aren’t as familiar with. I sing the beginning in French, and I have never sung in French before. CNN: What are you hoping to get in your stocking this Christmas? Archuleta: I don’t know. I have never been huge into presents. For me, the holiday has always been about spending time with my friends and family. That quality time is so important to me, especially now, because I don’t get to do it as much as I used to and I took it for granted so much when I was always around them. Now, it’s such a special time when I am able to hang out with them and be around them. Last year, we went to Las Vegas together [for Christmas] and we spent time together just watching movies and playing games and stuff. It was really nice. CNN: Are you working on another album? Archuleta: I am. It’s been really busy, but it’s been really great because I am happy to be able to do all of this. … Right now, I am writing for the next pop album, and it is so much fun being able to be involved in the writing. Being able to tell my story, and be more expressive with the music this time, means more of my personality will be in the music, not just the lyrics, but also the melody. People will be able to get where I am coming from with these songs. David Archuleta’s new album, Christmas from the Heart, is filled with entrancing, traditional Christmas carols, as well as captivating foreign carols in other languages. When I first saw the album art, I wasn’t crazy about it. The album cover is very boring and bland- a light white background, a picture of David Archuleta and some colored snowflakes. The title of his album is written in a light evergreen color in a calligraphy-type font. It wasn’t very original or impressive to me but after listening to the first couple of songs, my opinion changed completely. The album opens with a beautiful rendition of “Joy To The World”. The first thirty seconds weren’t anything special but near the end of the song, Archuleta really kicked out many jaw-dropping riffs and amazing, enticing high notes. Archuleta’s mature voice is suited unbelievably well to sing the traditional carols on his album. I was hooked. This album features many traditional songs as well as a few contemporary songs and foreign jingles. Songs like “Have Yourself A Merry Little Christmas (duet with Charice Pemengco)”, “Melodies of Christmas”, and “I’ll Be Home For Christmas” offer a unique more upbeat spin to the album. Songs like “Riu Riu Chiu” and “Pat-a-pan” blend in perfectly with the other traditional carols to create an elegant diverse mix of Christmas tunes. Listening to him sing traditional carols like “O Holy Night” and “Silent Night” made the butterflies in my stomach stir and gave my whole body chills of shock and joy. Archuleta’s voice really brings these normally flat carols to life and makes you crave to play them on repeat. Christmas From The Heart is the perfect way to celebrate the holiday season! It’s the perfect gift for music or Christmas lovers of any age. 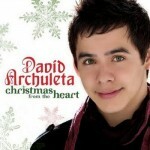 Archuleta’s new CD can bring Christmas spirit to any home. It will have your ready to rock around the Christmas tree and sing along with this new spin on traditional songs. With the Christmas season fast approaching, David Archuleta took some time out of his schedule to talk to The Daily Universe about his newly released holiday album, Christmas from the Heart, his rise in the pop world and his upcoming tour, which kicks off in Salt Lake City later this month. During this tour, which is largely in support of his holiday album, he’ll be traveling across the country through Dec. 20. The recording of his release, which features one original song, “Memories of Christmas,” provided the opportunity for Archuleta to let listeners in on his personal beliefs. Growing up in a Latter-day Saint home, Archuleta’s faith is pronounced throughout the 13-song album. His tour will feature some of the pop hits that helped Archuleta rise out of his American Idol-bred stardom, but fans should expect a Christmas-laden set list. Considering all that has been handed to him over the last few years, Archuleta has received his fame graciously. The exposure received from Idol, he describes, was largely unexpected. Although he grew up performing and even appeared on several episodes of Star Search at age 12, Archuleta wasn’t always sure about his future as a musician. “I seriously would always joke with my friends, ‘You guys are all going to be geniuses; you’re all so smart and I’ll be behind McDonald’s trying to sing for my food,’” he said. Until his touring begins at the end of the month, Archuleta is spending time in Los Angeles writing for his forthcoming album. He described the process as more personal and self-involved in comparison to his first self-titled release. As Archuleta has become a successful pop artist worldwide, he continues to push forward and expand his fan-base with each album. David is letting us know that his Christmas tour is starting on November 24 in Salt Lake City, Utah and hopes to see everyone at one of the tour stops. Hello to all! I’m sorry I haven’t made a blog for a while. I’ve been in the studio a lot doing writing and recording, and it’s been a lot of fun! Last week I got to work with Matt Squire and Victoria Horn, and this week I’ve been working with Daniel Bedingfield and Kina Grannis. They’re all really great and talented people! I can’t wait for you all to hear the songs that we’ve been working on 🙂 heheh. But I’ve been loving the writing sessions! While I’ve been working in LA, I’ve gotten to spend time with my aunt! It’s been a lot of fun getting to spend time with her and let her be a part of all of the things I’ve been doing down here. I haven’t gotten to spend this much time with her for years, so it’s always great to be with family and have good times. It’s been a hectic, busy week but we still manage to do some fun things here and there. All right, so Monday while we were writing, Kina told me she was going to the Imogen Heap concert. I just about passed out! I have been wanting to see Imogen Heap for soooo long and she’s one of my favorite musicians! So I got tickets for me and my aunt and we got to go to Imogen’s show. It was AMAZING! it was fun to see how nervous Imogen was and she was just so genuine and quirky. And then her music and the way she loops cool sounds is incredible. I couldn’t get enough of it, and she kept going until midnight lol. I was exhausted but I was so happy to watch her. But anyway, you can never get enough of Imogen but you’ve probably had enough of my blabbing lol. That’s all I have for right now! More writing today so I better head off. There are some fun things coming up this week that I’ll talk to you about next time! But until then I’ll talk to you later! This song really stood out to me when she performed it at the concert. SO good! DavidArchie – Had some good oatmeal for breakfast. On my way to a little photo shoot now. DavidArchie – Finished with taking pictures. Time to start the first writing session of the week! DavidArchie – @paulocoelho Oh haha well thanks! I’m glad to be able to read all the great uotes and thoughts you share! DavidArchie – @joywilliams Bahaha! I totally feel ya on that! DavidArchie – Wow really?? That’s awesome! Thank everyone for all the views! RT@Sharon NGHS 20,006,096 views for Crush by @davidarchie !Woot! DavidArchie – All right, well finished working on writing for the day. Good to be hangin’ with both Daniel and Kina again! DavidArchie – At the @imogenheap concert! Tom Exile is on right now and it’s pretty insane! Way cool. DavidArchie – Imogen Heap has little microphones on her wrists so you can hear all the instruments she plays on stage. Pretty cool haha. DavidArchie – Wow! That was a long but amazing concert! So glad I was able to go! Imogen is incredibly talented. DavidArchie – Had a phone interview this morning. Now off to the writing session for the day. DavidArchie – For those who are in LA and want to hear some good music, you should go check out @MatKearney at the Henry Fonda Theatre tonight. DavidArchie – Hello LA traffic. Looks like we’ll be spending a good amount of time together tonight. DavidArchie – Happy Veterans day! DavidArchie – Finished with interviews for the morning. Back in the studio to work on writing for the day. DavidArchie – Today is the year mark of when my first album was released! Crazy that’s been a year already! Thanks you guys for all ou’ve done!! DavidArchie – At Trader Joe’s getting dinner and food for tomorrow. What a glorious store. DavidArchie – Oh man I’m exhausted. Can’t wait to go to bed. Goodnight! DavidArchie – Time for some more writing. Today’s the last day working with Kina and Daniel. DavidArchie – I can’t get over the fact that Need You Now is on top of iTunes charts! congrats to @ladyantebellum! That’s so awesome to see. DavidArchie – In Palm Springs today. Going to have some brunch. haha. DavidArchie – At my tour manager’s wedding! Congrats Ray & Michelle! DavidArchie – I’ve decided that I like cranberry orange juice. DavidArchie – Had a good time at the wedding. Feeling pretty tired through. Ashlee was there. Haha. Let’s Go Back to 11/11/08. So my lovely peeps, I shall spam you! With videos and pictures and miscellaneous goodies from 11/11/08. WHEEEEEE. I Love All Access is again very happy to offer David Archuleta Ultimate Fan packages! The Christmas from the Heart tour begins in November! Enjoy an exclusive private mini-performance with David! A meet and greet with photo op with David! A pre-show party! Great seats! Exclusive David Archuleta gift bag! Crowd-free merchandise shopping and more! Check our website for specific on-sale date and time for the city you are interested in. We update often. 888-I LUV AXS (888-458-8297) Toll free from U.S., Canada, and Mexico. +800 I LUV AXS 1 (+800 458 82971) Toll free from the UK, Germany, Ireland, the Netherlands, Spain, Belgium, Switzerland, Australia, New Zealand, Austria, Denmark, Finland, Sweden, Norway, Czech Republic & France. More toll free numbers coming soon. So, the last stop of the Demi Lovato – David Archuleta Summer Tour was at the Trump Taj Mahal Casino Resort in Atlantic City. I never got the chance to watch David on tour, and given my renewed interest in David’s career, I really appreciated it when an Archuleta fan e-mailed me a link to download a fan-made live recording of David at Atlantic City (the recording is credited to someone called ‘STARRYNITES01′ – so thank you!). LOS ANGELES — A new Web site allows music lovers to watch concerts for free online, choosing from five different camera angles as they watch. BillboardLive.com says its new concert-viewing Web site offers visitors different perspectives on performances by Alicia Keys, Usher, David Archuleta, Daughtry and other artists yet to be announced. Music fans can select from five different views as they take in full concerts by these artists, focusing solely on the drummer or guitarist if they choose. The site also allows visitors to use Twitter or Facebook during the Webcast without leaving the show. The application is also available on Apple’s iPhone. New concerts will be added through February. Former American Idol contestant David Archuleta didn’t win the season he competed (that honor went to erstwhile Our Lady Peace fan David Cook), but in many ways it’s worked out better for Archie. He has never had to deal with the pressure or scrutiny of being the winner, but there is still plenty of enthusiasm surrounding everything he works on (including his recently-released Christmas album). Plus, he’s not hounded by photographers all that often. Really, it’s the best kind of fame. Still, it was nice to see him show up in the paparazzi viewfinders yesterday, as Archuleta was spotted leaving high-end Los Angeles eatery Il Pastaio with singer and songwriter Kina Grannis. Posted by: Black Wolf | David Archuleta holiday concert!!! !Hey Cazmos!! I CAN’T wait for the David Archuleta holiday concert! What? You don’t know what I’m talking about?? Well how about I inform you!! Every hour on the hour!! Can’t wait! See ya there!! David Archuleta’s fan base is as diverse as the global village itself. But there seem to be a few distinct categories developing. Which one (or two or three) best describes you? Hard to decide? Total Fangirl/Boy – Squeezes over every picture, word, event and song. A feeler. Totally into the sentiment of the music, the artistry, the celebrity, the moment. Everything David is wonderful 24/7. Knows all the websites to get up-to-the-minute info on all things David. Attends as many VIPs, concerts, and national anthem gigs as possible. A mosh veteran. A direct tweet from David is Nirvana. Has a hard-drive full of David photos and videos and screen caps. Even voted in the “Favourite David Archuleta Poll” poll. The Voice – Loves, loves, loves the Voice. The Voice is front and centre in all comments and thoughts; gets lost in the voice when listening to songs. The Forecaster – Tries to see into the future of David’s career and predict what is going to happen down the road; bases speculation on personal past life experience. assumptions and opinions. Magic 8 Ball optional. The Interpreter – Gives opinions about past and present events; may use available facts and speculates on the who, what, when, where and/or why of past/present events based on past life experience, assumptions and opinions. Has a future at the U.N. The Spiritualist – Feels the Connection to The Infinite through David’s artistry. Feels the joy when David sings. The Tittle-Tattler – Main focus is the world of celebrity; likes celebrity media and gossip. Likes the thrill of the drama of it all. Loves to stir up controversy. Sees all aspects of David’s life as topics for discussion since he is a Celebrity. Wishes David had been adopted by Jon and Kate Plus Eight so his life could be a reality show. The One: Dreams of being David’s soul mate 24/7. Practices signing “ Archuleta” during class. An incurable romantic. Wonders what Danish/Honduran specialties to serve on The Big Day. Has Target’s Bridal Registry on speed dial. The Reporter – Just the facts; gives us straight information, no varnish, no spin. May upload pictures, videos of events and/or mp3s on the net for viewing. Qualified to teach advanced cyber-detective training sessions for FBI, Scotland Yard or Interpol. The Parent – Feels very maternal/paternal. Worries about what David eats, when he rests and, in general, his health and welfare. Sends him warm hats, scarves and, occasionally, lunch money. The What If-er – Always looks at the dark side of events first and foremost. Worries about everything that might be or what currently is and why it shouldn’t be that way. Tends to see the glass as half-empty … or just empty. Music Fan – Bought David’s music because they “liked/loved” the song. Buys different types of music and not involved in the day-to-day minutiae of the diehard David Fan. Goes to David’s concerts just as they would any concert. This person is not likely here reading this. I must confess I fall into several of the above!!!! Excerpt: Utah pop singer David Archuleta is among those who have sported Nappi-label jeans. Actor A.J. Buckley from the “CSI” TV series liked the Nappi Satchel shoulder bag so much, he wore it on the show. Snapy Nappi Jeans – He does look good in his jeans! Angels for a Cause is pleased to announce our newest fundraiser. We have been working behind the scenes to create a fundraiser which will generate donations and bring unique limited edition items/gifts to the fans. David Archuleta was kind enough to autograph the David Archuleta Signed Quilt to benefit The Lisa Lopes Foundation. David Archuleta’s Vocal Range – This is a lovely video from a fan revealing the vocal ranges David can reach. Anniversary Congratulations to DAVID ARCHULETA! David performs “Crush” on Today Show and an Interview on Album Release Day November 11, 2008. Here we are on November 11, 2009 one year later celebrating this momentous occasion. This is truly an exciting moment for David and for his fans, as we look back and knew he would be a star. Thank you, David, for all your hard work and truly amazing performances!